This type of stylish, durable, full-size backpack can cost a small fortune. If you have some sewing skills, it's much more economical to sew backpack yourself. When you make your own backpack, you can guarantee the quality of the finished product by using quality thread and back-stitching to secure all of your seams. 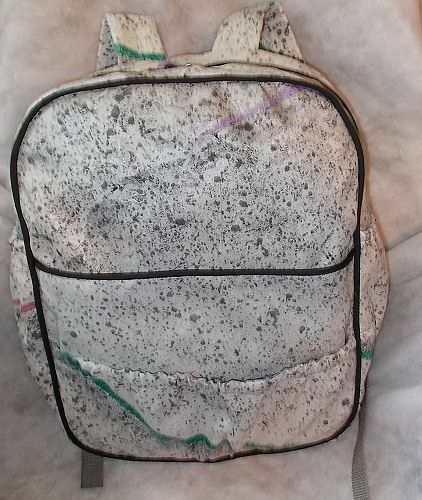 Since you are choosing the fabric and trims, your backpack can be in any color or pattern you want. There will be no mistaking which backpack belongs to who when yours is an original! This free back pattern features two front pockets and two side pockets. The padded straps ensure it's comfortable to wear and it is large enough to hold everything you need to carry. Tape the two print out sheets together aligning the green line and edges. Use a third print out or trace the pattern from the pink line down, adding 1" to the fold line to create Pocket B pattern Piece. Cut two of Pocket A on the fold. Cut two of Pocket B on the fold. Also cut one 14" pieces of 3/8" wide elastic for pocket B.
Webbing - Cut two pieces 3" and two pieces 15"
Cut two pieces 37" by 5" (these will be worked as one piece but two pieces give you more body). Cut two pieces 10" by 7" for side section pockets. Cut two 5" pieces of 3/8" wide elastic. Using a 1/4" seam allowance, attach piping to the top straight edge of one Pocket A piece. Place both pattern A pieces with right sides together, aligning all the edges. Using a 1/4" seam allowance, sew the pieces together on the straight top edge. Turn so right sides of the fabric are out and press well so the piping is on the edge. Top stitch just under the piping, through all the layers to hold the top seam and piping in place. Align and baste the edges together. Place both Pocket B pieces with right sides together, aligning all of the edges. Sew a seam across the top straight edges using a 1/4" seam allowance. Turn right sides out, with both pieces on top of each other and press so the seam is at the top of the joined pieces. Tops stitch a full 1/2" from the top edge. Thread the elastic through the casing that you just created at the top of Pocket B, sewing the ends of the elastic to the ends of the casing. Align and baste all of Pocket B edges. Sew two rows of basting stitches between the dots on the bottom of pocket B. Matching the bottom and side edges, lay Pocket A on top of the front body fabric. Lay pocket B on top of Pocket A.
Align the sides and gather the basting so the bottom of the pocket fits the bottom of the front section. Baste the side and bottom edges in place. Fuse the padding to one end of each strap piece on the wrong side of the fabric, leaving 1" un-padded on each strap. Fold the straps lengthwise with the right sides of the fabric together, aligning the long edges. Pin in place. Turn the tubes right side out. Press flat with the seam pressed to one side and centered on one side of the fabric. On the un-padded end, turn in a 1/4" and press in place. Place a Strap Adjuster on each 3" piece of webbing/strapping, putting the webbing on the bar closed to the "bumped end" going in and out on the back side of the adjuster, centered on the length of the strip. Fold the strip in half and bring the ends of the webbing strap together and baste them together. Place the strap adjuster and strap combo into the end turned under end of the padded fabric strap, centered in the un-padded end of the padded fabric strap, keeping the right side of the adjuster on the same side as the un-seamed side of the fabric. Fold in the sides of the fabric to fit the webbing strap and press the fabric in place. Stitch across the end of the fabric to hold the webbing strap in place and the sew along the angled edge to the padded area, pivot to sew across the end of the padded area, picot again to sew to the angled edge to the end of the strap, pivot and sew across the end of the fabric again to reinforce the webbing. Using the markings on the top of the body of the bag, align the ends of the padded strap with the edge of the bag and the side of the strap with an edge of the strap, placing the strap toward the edge of the bag. Stitch the strap in place in the seam allowance of the bag. Melt both ends of the webbing to prevent fraying. At the mark on the side bottom of the body of the bag, center one end of each strap aligning the ends with the edge of the bag. Stitch the end of the strap in place in the seam allowance. Using one of the two 20"" by 2 1/2" pieces, place the fabric right sides down on the right side of the zipper aligning a long edge to the edge of the zipper. Stitch the fabric to the zipper using a 1/4" seam allowance. Press the fabric back on itself leaving the zipper exposed. Top stitch through the fabric and zipper tape to hold the seam allowance in place to the side of the zipper teeth. Repeat for the second side of the zipper. Sew two rows of basting stitches on a bottom 7" edge. Turn under 1/4" on the opposite 7" edge. Press. Turn under again 1/2" to enclose the first turned under edge. Place the elastic in the hem, stitching it in place at each end of the hem. Repeat on the second side pocket. Place the pocket upside down, with the right sides of the fabric together, laying the seam line on the bottom of the pocket, on the marks on the side piece. Match the center of the pocket and the center of the side piece and pin in place. Gather the bottom of the pocket to fit the side section. Sew a seam on the seam line. Turn the pocket upward enclosing the raw edge. Sew across the bottom of the pocket sewing as close to the edge as possible. Baste the sides of the pocket in place, aligned withe the sides of the side piece. Repeat for the second pocket. Place the top end of the side section with the pockets attached, on top of the zipper section, keeping right sides of the fabric together. Align and match the ends. Place the other side piece on the opposite side so you are sandwiching the zipper section and when turned right side out the right sides of the side sections will face outward with the wrong sides together. Sew the two side sections and the zipper section together using a 1/2" seam allowance. Turn so the sides are right side out and press the ends of the zipper sections. Top stitch the ends of the side sections where they are attached to the zipper section. Baste the sides of the side sections together. Mark center top and center bottom on the front and back sections. This will be where the fold was on the pattern piece and can be found again by simply folding the pieces in half lengthwise and marking the center at the seam lines. Mark the centers of each seam side of the sides but matching the ends of the zipper sections and folding the zipper section and side section in half. Mark the folds at the seam lines on both edges. Keeping right sides together, match the center of the side zipper section to the center top of the front section. Pin in place. Keeping the side section straight, match the center of the full side section with the bottom center of the front section. Pin in place. Align the remaining edges and pin them in place. Sew the edges together,using the scant 1/2" seam allowance that was used to sew the piping on to the front section. Repeat the process to sew the back section to the sides. Trim and even the seam allowance. Apply a seam finish to prevent the fabric from fraying.